These 100% open end cotton washcloths are the perfect solution for budget-conscious buyers looking to maintain attractive rates while providing quality towels for their guests. Designed with classic white threading, accented by an eye-catching cam border, these washcloths are ideal for managing the costly problem of disappearing towels without sacrificing style or comfort. We use this towels in our yoga studio with some lavender scented organic oil. We place them on our clients eyes after a hot yoga class and they LOVE it! These are soft and perfect size. We have washed them a lot of times already and the quality is the same! We bought these to donate to a natural disaster relief organization and they seemed to be a good quality wash cloth. I would buy again. Considering the price I'd say you get what you pay for. worked OK for our service area ! I am Happy with my purchase ! These washcloths are a great purchase! Really great price for the product, great size, light weight while remaining absorbent- Excellent for restaurants. We plan on purchasing again. These cloths are great for any sanitizer bucket. They are good for extended use and are not too big which make them great for any use. These are your basic dish rag. Compared to others that I have purchased, they are very scratchy and would not suit using as a face cloth. The best quality washcloth and the cheapest price ever compared to another retails . they last for long time. they won't damage from washing them over. The twelve pack of twelve inch by twelve inch open end cotton hotel washcloths has met all of my expectations. I was pleasantly surprised at weight and durability after many washes. I would definitely order them again and highly recommend for commercial and residential uses. A great, thick washcloth that is ideal for motels and hotels. They are nicely packaged and arrive quickly. The washcloths are absorbent and soft, and our guests really love them. They wash well, and they hold up great after multiple uses. These are decent wash cloths. They are white in color they measure 12"x12". They feel a little rough and are a bit on the thin side. The 12" x 12" 100% Open End Cotton Hotel Washcloth exceeded my expectations. The quality is excellent. I was hesitant on using these for cleaning as that was my intentions. I definitely recommend these washcloths. 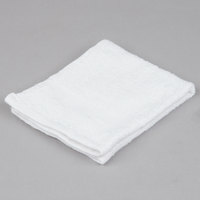 Great price for Cotton washcloth in webstaurantstore I used and wash them already. It's good quality. You can also wash them with bleach, no damage. We love the price and quality. And it's 100 percent Cotten. And it comes in 12 in a pack. We gave it 4 stars. Way to go Webstaurant store. These towels are quite thick considering they are advertised as "hotel" quality. These towels have held there quality through several washes so far. We have absolutely no complaints. I bought these towels wanted to try them I love them need to buy. More you can use them. For. Any occasion. Good. For price. Best towels ordered so far. Obsorbent. Easy-to-use, squeeze water from, wipes so smoothly. Purchased these all white towels from Webstaraunt. Best investment i have made. There are never enough washcloths, and with these cotton ones, we have extra on hand. Made of cotton, and white so they are bleachable and easy to clean. They should last a while. These washcloths are a bit lacking. They're somewhat thin and only fairly absorbent. Unfortunately one started falling apart slightly after only using it a few times. For the price I suppose they're OK. I don't suspect they will last for that long. I'd suggest spending a couple more dollars for some a bit higher quality. These washcloths are a nice, larger size than a lot of other economical ones I have seen. I was a little worried they might be really thin for the price, but they are actually really nice for the price. Used the Lavex Lodging Hotel Washcloth - 12" x 12" 100% Open End Cotton 1 lb. - 12 / Pack to clean my island at home. I love how the cloth felt in my hands while wiping and cleaning my island. Very sturdy and seems as if it will last. Just got these and already needed them. These are smaller, lighter towels but very absorbent. They did a good job in the kitchen, and on the counters. I ordered these as hand towels for use in the bathroom. Unfortunately they do not suit that purpose very well. They are thin, not very absorbent, and came slightly stained. One wash perked them up a bit, but about 20% of them now have ripped seams and are starting to come apart. Thank you for your review! We are sorry to hear that the towels you received were not in perfect condition. A Customer Solutions Representative will be contacting you to resolve the issue. These wash cloths are what they say they are. I use them as dish rags instead of hand wash cloths. They hold up decently in the laundry, and are well worth the price. Very good product at a great price! I use at a fitness facility to wipe machines and they work great! Very fast shipping as well! Absolutely love these!! They are perfect for washing and the best part is that they are reusable by throwing them in laundry!!! Awesome item for a good price!!! Thank you for your review! We’re sorry to hear you’re washcloths came dirty. A Customer Solutions Representative will remain in contact until the issue is resolved. This is a great product, and my customers love them I will do a lot of business with this great company. Keep up the great work, and fast shipping. Highly recommend! Looking for something durable but yet classy with a price that is affordable. Exactly what I needed! Will definitely be ordering again from this store! These Washcloths did the trick was looking for sturdy washcloths that are not super thick. I found them here and they worked perfect for making little stingrays for my young guests. Originally bought for our concession business, we have no incorporated these into our cafe as well. These things are really good washcloths, and we use them for everything from cleaning dishes to wiping down tables, and they hold up well. No way you'll find a better price for the quality. These washcloths are an excellent buy. They are economical, and they are also large, thick, and very soft. They are well constructed and seem like they will hold up for quite a while. These are such a great deal that you might wonder about them. They do hold lots of water, and are not too rough or thin. The Hotel Washcloth 12" x 12" 100% Open End cotton sold 12 per pack are great. I love how they do not shrink and stay soft, after laundrying. You can't beat the price. These are great economy washcloths, for business, restaurant or home. Works well and are all cotton to give you that added comfort while using them.